The most popular use of social networking in 21 countries surveyed last spring was sharing views on music and movies; a median of 67% said they put the sites to this use. Discussion of politics ranked significantly lower down the list with a median of 34% saying they engaged in it online. 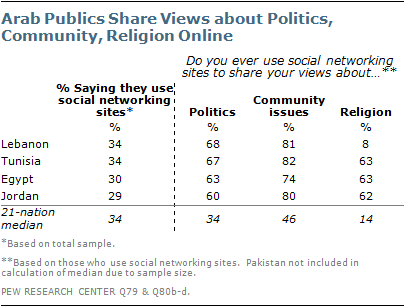 Use of social networking sites for discussion of politics ranked significantly higher in several Arab countries. The numbers using social networking sites overall in the Arab nations generally ranked in the bottom half of the nations surveyed. Still, in Egypt and Tunisia, two nations at the heart of the Arab Spring, more than six-in-ten social networkers said they shared their views about politics online. The same was true for social networkers in Lebanon and Jordan.